Six months ago, Melissa Nichols brought her baby girl, Arol, home from the hospital. And she immediately had a secret. Across town, first-time mom Candyce Hubbell has the same secret — and she hides it from her pediatrician. "I don't really want be lectured," she says. "I know what her stance will be on it." The way these moms talk about their secret, you might think they're putting their babies in extreme danger. Perhaps drinking and driving with the baby in the car? Or smoking around the baby? But no. What they're hiding is this: They hold the baby at night while they sleep together in the bed. Here in the U.S., this is a growing trend among families. More moms are choosing to share a bed with their infants. Since 1993, the practice in the U.S. has grown from about 6 percent of parents to 24 percent in 2015. But the practice goes against medical advice in the U.S. The American Academy of Pediatrics is opposed to bed-sharing: It "should be avoided at all times" with a "[full-]term normal-weight infant younger than 4 months," the AAP writes in its 2016 recommendations for pediatricians. The organization says the practice puts babies at risk for sleep-related deaths, including sudden infant death syndrome, accidental suffocation and accidental strangulation. About 3,700 babies die each year in the U.S. from sleep-related causes. AAP cites seven studies to support its recommendation against bed-sharing. But a close look at these studies — and an independent analysis from statisticians — reveals a different picture. And some researchers say it might be time for the U.S. to reassess its recommendation and its strategy to stop SIDS. Instinct and tradition, but is it safe? There is no question that many moms have an instinct to sleep with their babies. And many babies have strong opinions about wanting to sleep with their moms. Demanding to be held is a newborn's forte. There is good reason for this mutual pull toward each other, says James McKenna, an anthropologist at Notre Dame who has been studying infant sleep for 40 years. "Human babies are contact seekers. What they need the most is their mother's and father's bodies," McKenna says. "This is what's good for their physiology. This is what their survival depends on. What's more, the practice of bed-sharing is as old as our species itself. 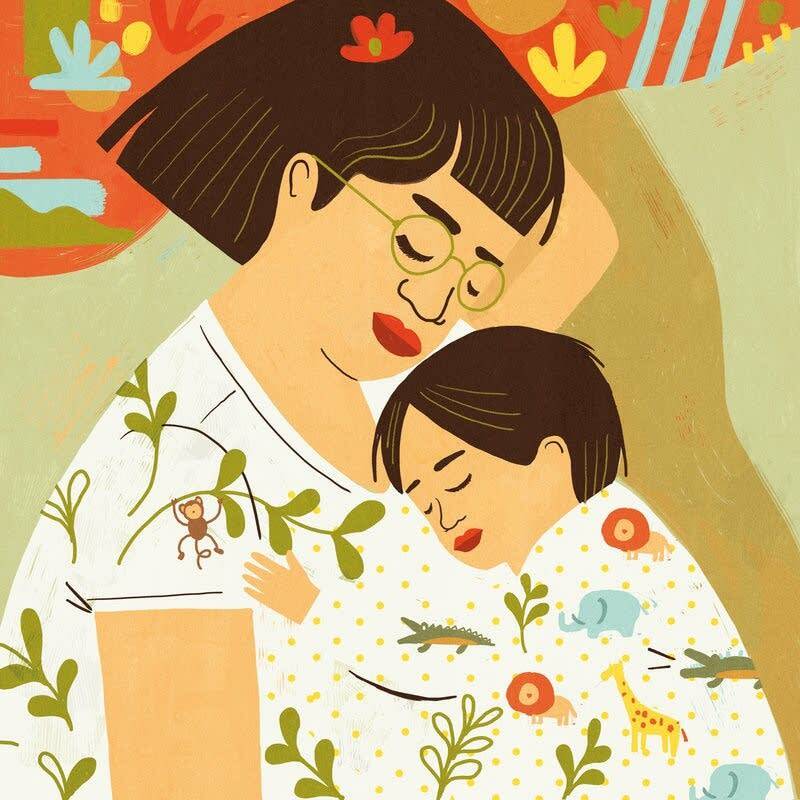 Homo sapien moms and their newborns have been sleeping together for more than 200,000 years, says anthropologist Mel Konner at Emory University. Modern hunter-gatherer cultures provide our best insight into the behaviors of our early ancestors, and bed-sharing is universal across these groups, he says. The practice continues to be widespread around the world. Bed-sharing is a tradition in at least 40 percent of all documented cultures, Konner says, citing evidence from Yale University's Human Relations Area Files. Some cultures even think it's cruel to separate a mom and baby at night. In one study, Mayan moms in Guatemala responded with shock — and pity — when they heard that some American babies sleep away from their mom. "But there's someone else with them there, isn't there?" one mom asked. Balineses babies are generally held almost every moment — day and night, anthropologists have noted. And in Japan, the most common sleeping arrangement is referred to as kawa no ji or the character for river: å·. The shorter line represents the child, sleeping between the mother and father, represented by the longer lines. Western culture, on the other hand, has a long history of separating moms and babies at night. Wealthy Roman families had rocking cradles and bassinets by the bed, historians have noted. By the 10th century, the Catholic Church began "banning" infants from the parental bed to prevent poor women from intentionally suffocating an infant whom they didn't have resources to care for. "Any women who kept an infant less than 1 year old in her bed ... is ipso facto excommunicated," the church declared in Milan in 1576. Back in the early 1990s, Notre Dame's McKenna decided to do what seemed almost impossible: Figure out just what happens at night when a mom sleeps with a baby. McKenna and his colleagues transformed his laboratory into an apartment, recruited dozens of moms and babies, and analyzed their bodies while they slept. "We measured heart rate, breathing patterns, chest movement, body temperatures, brain waves — even the carbon dioxide levels between the moms' and babies' faces." They even had infrared cameras to watch how the babies moved around at night. What McKenna found was remarkable. When the mom is breastfeeding, she essentially creates a little shell around the baby. "The mother naturally arches her body around her baby," McKenna says. "She pulls up her knees just enough to touch the baby's feet." Inside this shell, the baby hears the mom's heartbeat and, in turn, changes her own heart rate. "It usually slows down," McKenna says. The baby also hears the mom's breathing, which has a rhythm similar to the sounds the baby heard in the womb. "It contains that 'swoosh, swoosh' sound," McKenna says, "which in turns sounds like, 'hush, hush little baby.' ... It's no wonder nearly every culture uses a swooshing sound to soothe a crying baby." The baby also feels the mom's warm breath, which creates little clouds of carbon dioxide around the baby's face. That may sound scary, but the gas stimulates the baby's breathing, according to McKenna. It pokes the baby and says, "Hey, take a deep breath." And then there is the baby's and mom's movement. McKenna found that throughout the night, breastfed babies in the study don't move all over the bed, willy-nilly. Instead newborns stay laser-focused on one location: "The babies are basically staring at their mother's breast almost all night," he says. Even babies in cribs, when they're placed close to their moms, have a similar attraction to their mother: They turn their faces to their mom for the majority of the night. This tells him, McKenna says, that "babies have evolved to experience this closeness, night after night after night." Time to personalize the risk? Babies may have evolved to sleep with their moms on the ground — or on a thin mat — but they did not evolve to thrive in a modern bed, with a 6-inch pad on top of a mattress and giant goose-down pillows. "Of course, the parental bed can be dangerous," says Peter Blair, a medical statistician at the University of Bristol who has studied SIDS epidemiology for 25 years. "The Western bed was not designed with the infant in mind." In the early 2000s, several studies found that bed-sharing substantially raised a baby's risk of SIDS. By 2011, pediatricians started giving parents a strong, universal message about bed-sharing: "Don't do it," Blair says. "But it doesn't seem to have worked." For starters, some health agencies took the message to an extreme, Blair says. In Milwaukee, parents saw an ad in which the mom is portrayed as a meat cleaver. In another ad there, the headboard of the parental bed is portrayed as a tombstone and etched onto it are the words: "For too many babies last year, this was their final resting place." "These ads are saying, 'Not only shouldn't you sleep with your baby, but it's almost against the law, and parents should be arrested,' " Blair says. "It's quite unacceptable really. And it's not really the evidence." The early studies came with a major caveat, Blair says. They lumped together all types of bed-sharing, including when babies were put in very dangerous circumstances, such as sleeping next to a parent who was drinking, doing drugs or smoking. The studies also included babies who slept with a parent on a sofa, not a bed. In these cases, the evidence is strong and clear. Parents who drink or do drugs shouldn't be sleeping with their babies because they could roll over onto their child. Babies who are born premature or whose parents smoke shouldn't sleep in the parents' bed because of potential respiratory problems. Suffocation can also happen when babies sleep on sofas because babies can be trapped between a parent and the cushions. "These situations don't happen often, but when they do, they are often lethal," Blair says. "There have been many studies showing this." In one of these studies, Blair and his colleagues found a baby was 18 times more likely to die of SIDS when sleeping next to a parent who had been drinking. In another study, they found a similar risk for babies sleeping on sofas. But what about families who don't drink or smoke? Whose babies aren't premature or underweight? "The question really was: In the absence of these hazards, is there an increase risk in bed-sharing?" Blair says. So far, only two studies have looked at this question. And doctors and families need to be careful with how they interpret these studies, says Robert Platt, a biostatistician at McGill University, who analyzed the studies for the AAP. "The evidence is quite thin or weak," he says. In both studies, the number of SIDS cases is small. 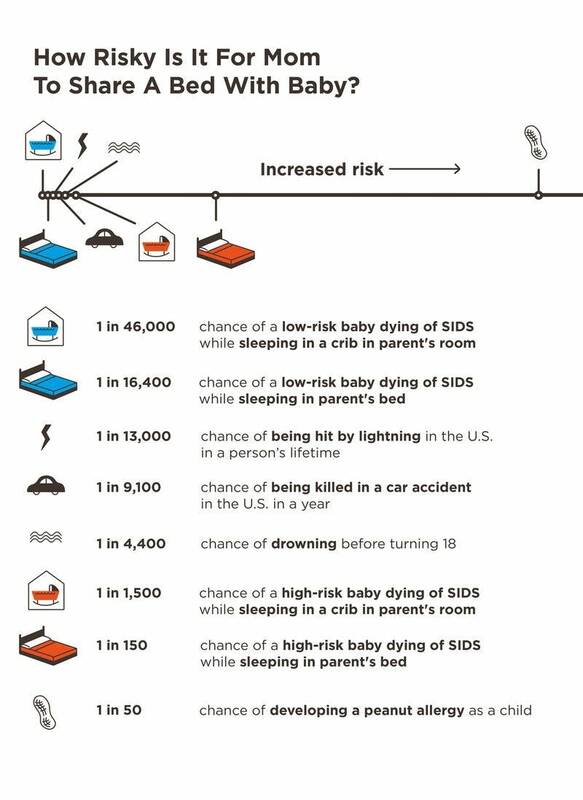 One study of 400 SIDS had 24 cases in which that baby had shared the bed in the absence of parental hazards, and in the other study, there were just 12 of these cases out 1,472 SIDS deaths. In the latter study, some information about the parent's drinking habits was missing and had to be estimated. Nevertheless, the two studies came to similar conclusions. For babies older than 3 months of age, there was no detectable increased risk of SIDS among families that practiced bed-sharing, in the absence of other hazards. And for babies younger than 3 months? "I would probably say there may be an increased for this group," Platt says. "And if there is an increased risk, it's probably not of comparable magnitude to some of these other risk factors," such as smoking and drinking alcohol. Overall, the two studies suggest bed-sharing — when no other hazards are present — raises the risk of SIDS by about three-fold. But to figure out what it means for a particular baby, you have to figure out the baby's overall risk for SIDS. "For many babies, the risk of SIDS is very, very low to begin with," says Dr. Ed Mitchell, a pediatrician from the University of Auckland, who has studied SIDS for more than 30 years. "If you take a very, very low risk and multiply by three, the risk will increase, but it will still be a low risk," he says. Take for instance, Melissa Nichols' situation. Her little girl was born healthy; she was full term and had a normal birth weight. Nichols doesn't smoke or drink. And she doesn't sleep with her daughter on the sofa. So her baby's risk of SIDS is tiny, even when Nichols sleeps with the baby. According to Mitchell's data, bed-sharing raises her baby's risk of SIDS from about 1 in 46,000 to 1 in 16,400, or an increase of .004 percent. And the baby is more likely to get struck by lightning in her lifetime than from dying of SIDS, even when Nichols sleeps with her. But for babies at higher risk for SIDS, adding bed-sharing into the equation can markedly increase the risk, Mitchell says. "When the background risk is high, and you multiply it by three, the risk becomes substantial." For instance, a premature baby with a younger mother and whose parents smoke and drink starts out with a moderate risk of SIDS — about 1 in 1,500. According to Mitchell's data, bed-sharing raises such a baby's risk of SIDS to about 1 in 150, or an increase of 0.6 percent. Now the risk of SIDS is high. By comparison, the risk of the baby developing a peanut allergy is about 1 in 50. In other words, all bed-sharing is not the same. It doesn't add the same amount of risk for all families. And so perhaps recommendations about it shouldn't be the same? Maybe they should be tailored for each family and their circumstances? This is the approach that doctors in New Zealand have been taking, and the results have been tremendous, Mitchell says. "We've had a 30 percent reduction in mortality since 2010," he says. Specifically, they've been figuring out which babies are at high risk for SIDS. Mitchell has even created a calculator that will give families their personal risk. Then for families at high risk, they're not simply saying, "Don't bed-share" — they've found that many families don't heed that advice — but rather, they're teaching families how to bed-share more safely. For example, they talk about what increases the risk, such as drug use and alcohol use, and they give families a so-called Moses basket so that the family can bring the baby into the bed, but the baby is protected from a rollover by this separate sleeping container. "We're now talking about safer bed-sharing," he says. "And that takes all the steam out of the controversy." It also helps parents feel less judged by doctors, says the University of Bristol's Peter Blair. The United Kingdom has been following a similar approach. He thinks it allows doctors to give families better advice about SIDS. "We recognize and acknowledge that bed-sharing happens. We don't promote it, but neither do we judge people about it," Blair says. "By doing that, you can open up a conversation with the parents about the really dangerous circumstances when you shouldn't do it." Over the past few decades, the U.K. has also seen a large drop in SIDS. Since 2003, total SIDS deaths has fallen by 40 percent, from about 350 deaths per year to about 200 deaths per year, the nonprofit Lullaby Trust reports. At the same time, the SIDS rate in U.S. has nearly plateaued at about 90 deaths per 100,000, the Centers for Disease Control and Prevention reports. Blair thinks it could be time for U.S. pediatricians to reconsider their approach to advice about bed-sharing. "When you come out with a simple message, 'Don't bed-share,' then the conversation stops there because you're not supposed to be doing it," he says. The AAP is standing by its universal recommendation against bed-sharing, says Dr. Lori Feldman-Winter, a pediatrician at Cooper University Health Care and a member of the AAP's Task Force on SIDS. "The studies that we have provided us with enough concern that we couldn't make the blanket recommendation to recommend bed-sharing in a safe manner," she says. "That [approach] was something that we talked about and thought might happen in some future time." But Feldman-Winter acknowledges that some parents want to bed-share — and many may hide the practice from their pediatricians. So in 2016 the AAP made changes to its recommendation to address this issue. "We don't want to put our heads in the sand," says Feldman-Winter. "We definitely acknowledge that it happens. And so given that, we have provided the best guidance we can around how to alter the bed in a way that we think may work to reduce the risk of SIDS." Pediatricians also need to be less judgmental about the practice and more tolerant of families' choices, Feldman-Winter says. "We don't want families to feel uncomfortable telling doctors what they're doing," she says. "Because then you take away the opportunity to provide education around what we do know about SIDS — and to be honest about what we don't know."